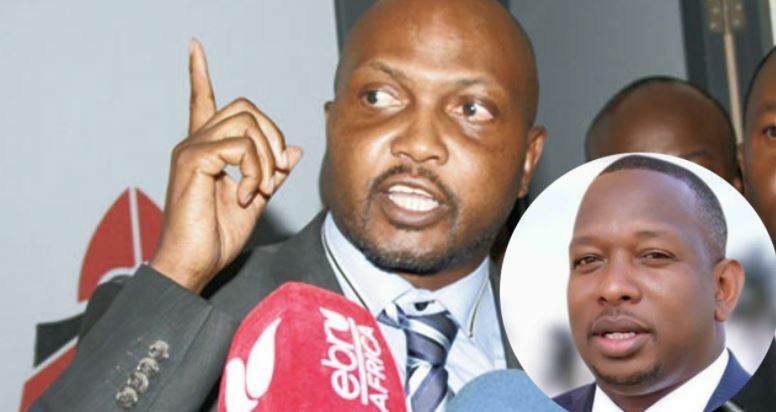 Gatundu South MP Moses Kuria has pleaded with Mike Sonko to leave civil servants out of politics. This after the Nairobi Governor accused Interior Principal Secretary Karanja Kibicho of holding night meetings to plot against Deputy President William Ruto’s 2022 presidential bid. According to Moses Kuria, anyone who touches on civil servants questions the authority of President Uhuru Kenyatta. During an interview at Kameme FM on Tuesday morning, Sonko had alleged that Kibicho had ganged up with former State House political adviser Nancy Gitau and two senior top officials in President Uhuru Kenyatta’s administration to scuttle DP Ruto’s presidential plans. Kibicho, who is in charge of the intelligence and security portfolio headed by CS Fred Matiang’i, dismissed Sonko’s allegations and advised the governor “to concentrate on cleaning up Nairobi”. “We don’t do night meetings and if we did, I would tell you. Nobody is trying to fight the DP but there is a cartel of people who always act like they are his protectors. I run the intelligence of this country and there are no such meetings,” said Kibicho. “Tell Sonko to man up and address the people he wants to address but not through me. He should address that person directly because that’s what men do. I am not a politician and neither would I be politicking around the DP,” an angry Kibicho said as quoted by The Star. He added that his differences with the Nairobi County boss started when he stopped Sonko from flying two flags on his official vehicle. “When you are drowning, you hold on to everything including straws. Tell him to leave Kibicho alone and start cleaning Nairobi,” fired Kibicho. Anybody touching on civil servants is questioning the authority of the appointing authority, who is President Uhuru Kenyatta. I believe in giving civil servants a free hand to work without interference. I am personally very protective of civil servants. I want to plead with Sonko — who is one of my greatest friends and for whom I vigorously campaigned, despite there being Kikuyu candidates running against him — that he needs to leave civil servants out of politics. Let him deal with politicians. For me, civil service is a no-go zone. The Kikuyu community knows exactly whom they will support for President in 2022 and they will vote for that candidate spontaneously without instructions from anyone. There has never been any central meeting anywhere to guide Kikuyus how to vote. History proves this. Apart from the meeting at Kigiriti in Thika to decide on founding President Jomo Kenyatta as the leader of Kanu and the one to approve Joseph Kang’ethe as the as the leader of the Kikuyu — there has never been any other central meeting to tell the community how to vote. The community makes spontaneous decisions as they did in 1997 when they voted overwhelmingly for Mwai Kibaki, almost to a man. There was a meeting in Thika, which I attended in 1997, which tried to have the community vote in a certain direction, but that failed. The community said they would not be guided how to vote and voted for Kibaki. Even when Kibaki retired in 2013, there wasn’t any meeting to decide to vote for Uhuru Kenyatta. They woke up and from the shambas and their groceries, came out and voted for Uhuru. They will again make their decisions spontaneously in 2022 without taking instructions from anyone. Anybody claiming there are meetings is misguided. I want to caution Sonko that before he makes such claims in public, he first needs to exploit the Jubilee party’s internal dispute resolution mechanisms. He may be trying to make a mountain out of a molehill. I want to plead with him, let him first raise his concerns within the party hierarchy before making them public. I campaigned for him, I even took him to my constituency and many other places. He is a man of respect, but I want to request him to hold his horses.